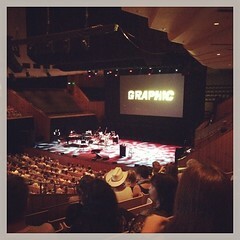 I went to the GRAPHIC Festival this weekend at the Sydney Opera House and now my brain is buzzing with ideas and creative juices. 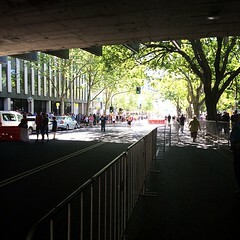 But it is also overtired from Daylight Saving beginning and a lot of walking, so I'm going to have to make this quick! Here goes. Certain areas had been blocked off and they were only letting ticket holders through, so it was quite a relief when I finally got in the building to where I needed to be. I ran into some of the Canberra comics folk (Emma and Gavin), as well as some of the Sydney comics folk (Julie, Tim and Hayden), and we got to hang out for a bit (which was really nice as usually I see them in passing or just on social media), gobbling down lunch before the next event started. 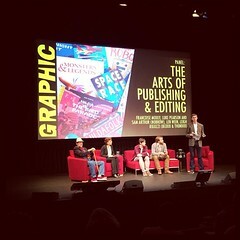 The panel was chaired by Sam Arthur of Nobrow Press in the UK, and consisted of Luke Pearson (an illustrators who has published books with Nobrow and also created art for the cover of The New Yorker ), Len Wein (comics editor and writer, who has worked for both DC and Marvel), Leigh Rigozzi (editor of the Blood & Thunder anthologies) and Françoise Mouly (who, along with her husband, Art Spiegelman [creator of Maus ], edited RAW magazine and its related books until the magazine ended. She now works for The New Yorker as well as publishing children's comics under her own imprint, Toon Books). I'd been badgering the Opera House people on social media about whether Dave McKean (who, for people who know nothing about comics, is an artist, graphic designer, filmmaker, musician and longstanding collaborator partner to Neil Gaiman). Fortunately they replied before I had to leave the house, so I brought something along to be signed. But since Dave's first session wasn't over yet, I checked out the Kinokuniya bookstall and, on the strength of hearing from Luke Pearson and Sam Arthur in the panel just gone, bought a copy of Hilda and the Midnight Giant . 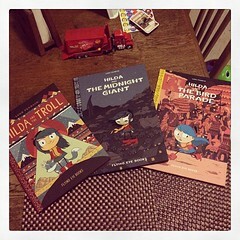 (I didn't know which Hilda book came first really.) I got it signed by Luke, who also did a very nice doodle in the front, and I also got to talk to Sam a bit more about comics editing (against noise backdrop of naval planes going by overhead). 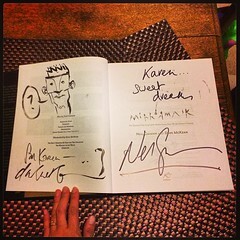 So now it's been signed by both Dave McKean and Neil Gaiman! It was a really interesting show—part lecture about comics and comics history, part illustrated autobiography and mostly a showcase of these really old woodcut novels (and related works), or excerpts of them, by artists I'd never heard of, which we viewed one page at a time alongside Phillip Johnston's score. It was amazing stuff and I wish I hadn't been so sleepy because I'm sure I missed little bits of it when my brain started having microsleeps. There was a short Q & A afterwards, during which people could ask questions about the work and what it was like for Art and Phillip to collaborate. I was pretty hungry too and tried to find something to eat, but there were a lot of people around outside (which made me not want to venture outside), the café just outside that section of the Opera House was being used for a private navy families function, and the bistro inside didn't have much by way of dinner options: it was basically junk food or a cheese box, and I was wary of getting a cheese box because there were a bunch of soft cheeses in it and I didn't know if they'd been made from pasteurised milk (because there's the risk of getting listeria and hence a miscarriage from unpasteurised milk, which is why they tell you not to eat soft cheese when you're pregnant, but really a lot of the cheeses in Australia are made from pasteurised milk). I ended up opting for junk food, but it turned out I still had enough food left to tide me over somewhat—my banana, the rest of my salad and a muesli bar. 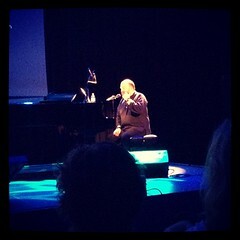 I confess I had no idea that Dave McKean is musical. He said that when he was younger, he used to be able to keep both facets of his life in the areas of both art and music going, but then it got harder and harder, and art won out. However, he said that recently he'd been going along to open mike nights at his local pub and trying out new material there, and he and some other patrons decided to form a songwriting group in which they would get together once a month and showcase a new song they had written—for an audience of three, but hey! An audience! His show was really interesting: it was like a collection of short stories—but some of them were little films (animated and not-so-animated), during which he did all the voiceovers, and some of them were songs (which may have also had accompanying graphics/video). And yes, there were nine of them. They varied in length, and of course there were some that I liked more than others (I think my favourite was the one he told about his father's story, which was represented onscreen as a jagged shard of glass), but overall, it was a fantastic evening and I was glad I had bought a ticket. 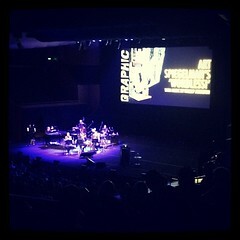 After McKean's performance, I was hungry, tired and I had a headache. So even though I had vaguely toyed with the notion of staying around for the fireworks and light show (which was happening as part of the International Fleet Review, and it would have been a good opportunity to go because I was still in the Opera House area and only ticket holders were allowed there), I thought I had better head home before I crashed. Getting back was a bit of an ordeal though because it wasn't quite clear where to go. 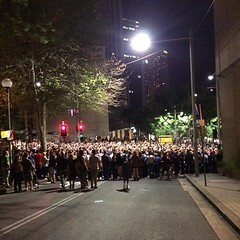 I finally figured out that I had to head back up Macquarie St (which was a bit painful with the PGP), then down Alfred St, and then I had to cut through a rather large crowd (entranced by fireworks they could barely see because the Cahill Expressway blocked their view) in order to get to the station. 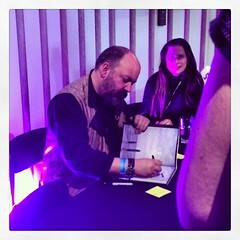 Dave McKean: When he gets an idea, he works on it from different angles: what does it sound like? What does it smell like? etc. Some feel that they should be comics. Some need sound so they will be a film. He works on a feeling or atmosphere that comes out in different ways. It's strange territory that affects everything, and he'll spend a year or two in that world and then move on to another one. DM started his career having total control but recently he's been allowing others to contribute—to play and do their own thing. “Roll with it rather than fight it all the time.” (e.g. when making films). It's the best part of collaboration. Len Wein: Question: Does he have a preference for a medium? He knows when he starts. “Always work and write to the medium you're working with.” The example of superhero movies and changes being made because the original thing doesn't work in film. Stories have to exist in a different way (example of working on Batman animated series). GM: At the end of the 90s, you got a lot of cinemascope panels in comics: four panels to a page. People being influenced by movies. On Arkham Asylum (for non-comics people, that's one of the great Batman books): What was that collaboration like? DM (speaking about the day GM pitched Arkham Asylum to DC, which happened to be the same day he and Neil Gaiman pitched Black Orchid to editor Karen Berger): “Neil, he's a hustler. He puts his foot in the door.” LW created the backstory for Arkham Asylum . GM had the idea of setting an entire story there. DM broke down and rearranged GM's script (but refused to draw Robin.) DM says he isn't into superhero comics and didn't really get them. But once Batman became a symbol/metaphor, it worked for him. Superheroes are so specific. DM also says he didn't know who all the characters were. LW says he loves watching the evolution of characters—especially his characters. There was some talk about working on minor characters who get revamped. There was also a bit of a discussion about art school comics inspired by blend of horror and poetry (and LW) that became quite influential. LW was fortunate to have been edited by Julie Schwarze et al—the last great generation of Golden Age editors and the first great generation of Silver Age editors. He was fortunate enough to have been taught by people who knew what they were doing. The first third of his career, he was his own editor. 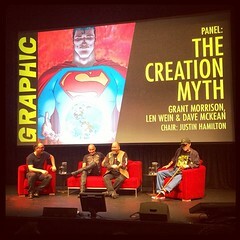 LW talked about working with Alan Moore (creator of V for Vendetta , The League of Extraordinary Gentlemen and Watchmen , among other things) and rejecting some of his stories for Swamp Thing . LW talked about working with an artists whose layouts were completely different to the final art, but who could justify his choices and persuade LW that he was right. GM had pages redrawn for the reprint because the concept was too abstract for the artist at the time. GM: “With Arkham , it was so much more bigger and exciting than I'd envisaging.” (on working with DM). What work should people start with when being introduced to your stuff? (Definitive or introductory.) GM: Creator-owned stuff. DM: Usually the next thing. “What I tend to do is finish the last page and forget about it—move onto the next thing.” (DM doesn't think comic art belongs in galleries. He likes books. But he gets asked to do gallery shows. 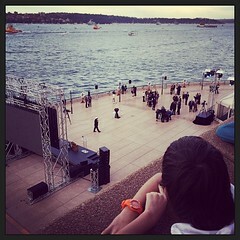 He likes storytelling so is interested in telling stories through gallery shows.) LW: Swamp Thing . I didn't really get to eat before going into that panel, so I was keen to sit down and eat properly afterwards. I kept running into people I knew, though—people involved with the Sydney Comics Guild, Emmet again, and the insanely talented Louie Joyce, whom I had met at Comic Gong. (He explained Home Brew Vampire Bullets to me because although I'd seen stuff about it on social media, I didn't really get what it was.) 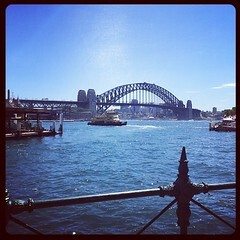 I ended up having lunch with a girl called Irene whom I'd met through Sydney Comics Guild things, and we talked comics, writing, stand-up comedy and Woody Allen for a good hour before it was time for the next thing. This was a free event but you still needed a ticket to get into it (?!!) Yeah, I don't understand either. Anyway, I got in and managed to get a good seat, plus I got to catch up a bit with Yonas from the Sydney Comics Guild. Sam and Alex are both collectors: they love old books, ephemera, etc. They looked at the types of things they loved—the reason why they've gotten into doing what they do now, e.g. Charles Harper illustrating The Ford Almanac (very graphic, industrial background => glamorous); Godzilla books/annual; gorilla book with yellow background (which led them to think about print process); Black Bob: The Dandy Wonder Dog ; Ladybird books (particularly the non-fiction ones, which Sam liked best. Ladybird books were one book printed on one piece of paper folded up and cut. They were an amazing product with amazing illustration. 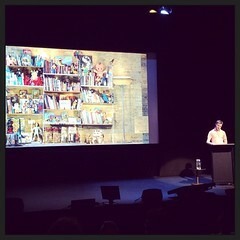 Sam said he spent one period in between jobs buying several hundred pounds' worth of Ladybird books). A friend designed the Nobrow logo as a linocut. It reflected their interest in print-making. Then they turned the studio into an exhibition space because it was being used just to store boxes and they thought that wasn't the best use of space. The exhibition space was a way to tell people what they were doing. They look after their interns! For a book launch, when it became clear that the interns had spent all week and had only completed 50 cutouts, they got the rest lasercut. They couldn't do small press silkscreen books if they could only sell 50 copies at a time. So they did a magazine. The idea was to give illustrators at a platform to show what they could do—give them an opportunity to do their own work. Their personal work was getting missed because there was nowhere to put it. It was anthology for illustrators: “In the beginning, we liked the idea of giving illustrators a chance to flex their muscles more.” Each issue had a theme and a colour palette as a unifying principle. They continued the aesthetic of the gorilla book with spot colours—Pantone colours. The illustrators had to make things in layers for print. Their books stand out because the colours are not typical. From issue 6 onwards, each issue has a double cover and is half illustration, half comics. A lot of the artists they work with come via the magazine, which then leads to other works. They started publishing 17cm x 23cm comics that had a fixed page length. Their distributors told them they couldn't do it because the comics were saddlestitched: they didn't have a spine. They said, “What does that matter?” The issue was you can't see it on the shelf if it has no spine => nosedive in sales. Then Nobrow did some books with spines, but those didn't sell as well as the others. Nobrow became known for their books printed in spot colours. They also did concertina books. Hildafolk (Luke Pearson) became a bestselling series. It started as a 17x23 book and it's now been translated into six other languages. Their print process: instead of doing things themselves, their books are now sent to a proper printer. Most books are printed CMYK—with overlapping dots. 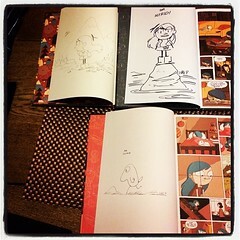 Because Nobrow's books are printed in layers, it's exciting: they're never sure how it will turn out until they see it. Their artists work in black and white, creating different versions of the same picture, with the black being substituted for the different colours. So it's sort of like CMYK but not. The printer proofs they get are characterised by flat colour, which is more vibrant. Most books usually don't have that much ink on the page. But with Nobrow's stuff, often it's 300 per cent ink on uncoated paper, which creates somewhat hallucinogenic effect. People always comment that their books smell nice! Then they opened up a shop: it has space for exhibitions, but they also sell things and get their name out. Bookshop shelves are hard to find! They're on Great Eastern St in Shoreditch, but they will have to move soon because the rent has gone up. Last year they started ELCAF: East London Comics and Art Festival in 2012. It's a one-day event to bring together illustrators, comics artists and screen printers. For their first one, 3,000 people attended. 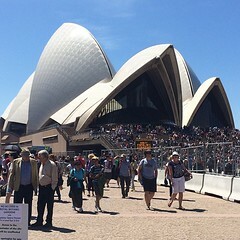 They queued to get in. This year, they charged £3 because they wanted to bring in more international guests. They held talks, signings, workshops, and they're planning to run it again next year. In terms of submissions, Nobrow interested in great concept and great execution. What's next? Sam doesn't know. I also got the chance to chat to Sam again briefly before he and Luke were whisked away to the next thing. And then I ran into Tim again, who was sitting with some of the Melbourne comics folk—including some of the Squishface Studio crowd and Sarah Howell, whom I'd also met at Comic Gong. She told me a bit about her new project and we chatted about how to get feedback, as well as the sort of comics we liked. Then I had to get away because it was time to go to church. Overall it was a fantastic weekend and I'm so glad I was able to attend all the stuff I did. I was really inspired by the work that all these massively creative and talented people had done, and I loved being able to catch up with people from the Australian comics scene and talk various aspects of comics. Things I took away from the weekend included a strong desire to make books (probably building on an existing one), (related) a desire to make more comics, and a strange impulse to get into comics editing (though how to do that without becoming a comics publisher will be difficult. I think I would need to team up with someone who is more business-minded than I am: they can take care of the operations and money, and I will take care of production. But then who would want to work with me? I can be exacting. I also don't really have the experience—I only know vaguely what I'm doing). Right. Brain is failing. Bedtime.